Publisher Team 17 Digital Ltd. The Shawshank Redemption, Prison Break, maybe if you’re old enough, a little bit of Porridge or The Great Escape - chances are you’ve had some sort of exposure to what life isn’t quite like behind bars. It isn’t all chipping away at brick walls, taking moulds of keys and doing other cons a favour in order to get in their good books. It’s about doing your time, quietly, keeping out of everyone’s way and getting released back into the loving arms of your family. Except if you’re playing The Escapists, in which case it’s exactly like all that stuff I just mentioned and then some. If you can think of a prison-based cliché, chances are it’s thrown in here, and developers Mouldy Toof Studios have done everything they can to draw from a lot of different source material, mixing it in with their own creative ideas to generate a pretty compelling puzzle role-playing game. The objective of any given prison is incredibly simple: you just need to ecape. It doesn’t matter how you do it, when you do it or who you screw over along the way. Leaving the prison will ‘unlock’ the next level and, with it, greater challenges, more content and a higher difficulty. There isn’t a story to speak of, you’re just in a sandbox that happens to be a prison… and what a sandbox it is. Being locked inside a single environment in a videogame is pretty rare, by all accounts, even more so when there is a routine to follow and any transgressions are met with harsh punishments. That description sounds like a recipe for boredom, a concept crying out for a story, but kudos to Mouldy Toof Studios for not caving in and, instead, just allowing the game to exist in a state where the player could find it the most accessible – here’s a prison, break out of it. This ‘freedom’ right from the get-go is actually a little jarring, and unless you’ve got nothing else to play or have been really looking forward to this title, you may find the lack of a solid tutorial somewhat off-putting. You’re given some very basic bits to get you started, but that’s about it really. 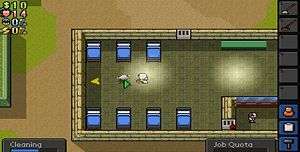 Although following the routine of living in a prison is easy enough, and you’re given plenty of cues for bits that you encounter throughout a normal day, certain areas, such as crafting, trading goods and how to make nice with people that have taken a disliking to you, are all left out. These things (crafting especially) are so key that a lot of what you do in the first few hours will be trial and error. While this is how many games function in the early stages, certain elements of The Escapists mean that you could possibly lose hours of progress because of a rule or condition that you weren’t aware of. It’s hard for me to be entirely critical of this process because it makes the payoff of success all the more sweet. However, I can imagine this method of doing things will put some people right off the idea of playing past those first few hours. The actual planning of the escape is something that has to be fitted in around your general existence inside the prison – the game would be too easy if you were just left to craft a way out without any risk of repercussions. The routine starts in the morning, with roll call, then moves on to breakfast and a free period. After this you have lunch and then, possibly, work (if you have a job), followed by exercise and showers. Finally, there is dinner, evening free period, roll call and lights out. These change between prisons, which certainly shakes things up when it comes to planning different escapes between levels. These routines sound easy to manage, and while they are (for the most part), you may find yourself going through the motions and not actually making much in the way of progress towards your escape. Being seen by a guard outside of activities such as lunch or exercise will bring you heat. At a certain point, enough heat will mean the guards come and break in their new nightstick on your head. This will land you in the infirmary and get all your illegal contraband confiscated, something you will not want to happen. So it’s in your best interests to follow the routine, keep the guards off your back and… never leave? That’s the very beautiful balancing act of The Escapists - a constant see-saw of excitement and risk – there’s no time limit on how quickly you have to leave but, equally, the game is no fun if you’re constantly just plodding along. The very lack of limits and time restrictions means that any mistakes made through pace, rushing and general problems that arise are usually a product of your own doing. So you’ll start by getting a feel for the prison, learning the routines, and understanding what works, but soon you’ll start trying to break the bonds and push against established boundaries to see what is and isn’t acceptable within the confines of the prison. You’ll soon find that you can do favours for other cons, netting you money and good karma in return. You’ll learn that you can break into other people’s cells and steal their things if you’re quick enough. You’ll discover that you can knock out guards and steal all their stuff if you do it quietly enough. Sometimes, though, you’ll get your fingers burned and that’s when The Escapists can bite you in an unpleasant way. Two scenarios demonstrate this perfectly: firstly, there will be occasions where your cell gets searched and any contraband may get discovered. Now, chances are you could be holding a dozen or more items and if they get found, they’ll getting confiscated and you’re getting thrown in solitary for the day. Thankfully, they announce this at roll call, so you’ve then got around twenty seconds to run to your cell and grab what you can and flush the rest down the toilet. This is a perfectly fine mechanic in play and one that’s grounded in reality – the tossing of the cells seems random enough that I’ve only been subject to it a handful of times – so you can swallow this occasional loss of items. Scenario two, however, is something of a pain in the backside and my overarching bugbear with The Escapists as a whole. One of the earliest methods of escaping that you’re introduced to is the unscrewing of the ventilation cover in your room. This requires either a screwdriver or a file, both of which either need to be stolen or purchased from another con. Furthermore, these items degrade – you’ll need at least two files or one screwdriver to do one vent cover. In order to access this, you need to stand on the table in your room, which I did during the dead of night, with the guards patrolling the halls. I was fine doing so as none of them actually stopped to look in. As soon as the vent was off, I ambled up into the vent shaft and… was caught. A patrolling guard spotted the missing cover and then that was that. I got caught, everything got confiscated and I was back to square one. It was particularly irritating because this could have been avoided with a fake vent cover made out of papier-mâché, but that’s not the point. The point is that we have two events here that impede your progress, but in one of them the rule that the game wished to impose was explained to the player beforehand. I don’t personally think that unexplained rules punishing the player is good game design – that’s just my opinion, some people enjoy the tougher approach – but most games provide gamers with either a full explanation or nothing at all. I accept death and disappointment in a game like Don’t Starve and The Binding of Isaac because they give me nothing to work with and expect me to learn everything. Games that provide you with half the information are frustrating, and while it’s a minor bugbear for some people, it really took the wind out of my sails when playing The Escapists, especially given that the vent cover unscrewing is covered in the tutorial but nothing is mentioned about covering the hole left. All that being said, this is still a great game. 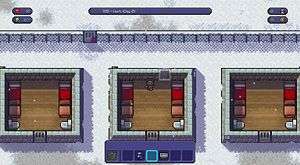 The gameplay flows very well, regardless of what prison you are in, and new elements are introduced such as metal detectors, stun batons, guard towers and so on. 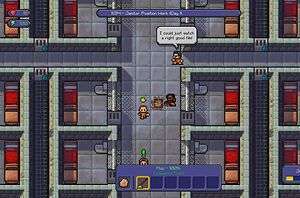 Each level also introduces more guards, more cells, more inmates, more security, and more jobs but, of course, increased ways to subvert, avoid and ultimately escape. Some of the gameplay decisions can be frustrating but those frustrations are, by and large, kept to a minimum, and what’s left is certainly more than pleasing if you’re willing to put the hours in. The style of graphics really works here, too, and at a glance you could be forgiven for thinking that the developers have just ripped off Prison Architect. Instead, a 16-bit graphic choice re-enforces the cheeriest and most happy-g0-lucky prison that I’ve ever seen - The Green Mile this isn’t. All the characters have cute little uniforms and everything is given a little bit of attention, from the dirty overalls to the big yellow padlocks on doors. Sometimes I wish the graphics weren’t 16-bit or that characters moved a little slower – trying to track down certain people when everyone looks remarkably alike save for a different shade of hair can be somewhat frustrating (especially if you get a job as a postman) but, for the most part, the style works. The audio is also surprisingly chirpy and didn’t offend me nearly as much as I expected it too. It does get a little repetitive at times but what you do have to work with is neither inspirational nor offensive. Much like the graphics it’s pretty pleasant and isn’t going to make you rip your hair out. Kudos for the tense musical changes when you’re getting up to things you shouldn’t be, too, rather than just having general stuff playing in the background as you attempt to circumvent Fort Knox. If you’re looking for a time sink and can see past a few shortcomings, The Escapists is certainly for you. Mouldy Toof Studios have done a stellar job with a concept that I didn’t think I needed in my life, let alone one that could have been developed well enough to earn as much praise as it has garnered. There are multiple prisons for you to break out of and, probably more impressively, there are multiple ways to do it, meaning that you’re not looking for the silver bullet to the puzzle. Sure, some leg work needs to be done to learn, understand, and create your exits and the crafting system may leave you wishing for some direction but ‘doing time’ was never going to be a piece of cake. Timber + Wire + Razor Blade = Whip? I really enjoyed my time with The Escapists and I am happy to recommend it because there isn't anything else out there quite like it. It's cute, it's cuddly and it's full of people trying to hit you with a sock+bar of soap = soap mace. Soap maces are awesome. However, the trial and error of the crafting system means that you either need to constantly guess or pay for tips using in-game currency, both of which kinda spoil the fun in equal measure. My advice to you - and my recommendation overall - is that this is very much a strategy game as much as it is a puzzler, and it's very much a game to be treated as a slow burner rather than something you'll finish over a weekend. You need to learn, you need to understand, and you need to think - just don't be surprised if the game tries to pull the rug out from under you when you reckon you've got an even footing. All credit to Mouldy Toof Studios - I'm looking forward to their next project.